This week I was joined by the wonderful Robyna May on the Happy Lawyer Happy Life podcast. Robyna is another great example of the idea that there are ‘many ways to be a lawyer’ having undertaken a dual degree in IT and Law, having always worked with law firms but never formally becoming a ‘lawyer’ in the technical sense of the word. I met Robyna a few weeks ago at the ALPMA annual conference, when we were presenting together on a panel and after watching her expertly manage a room full of lawyers and a panel of experts I learned enough about her to know I needed to know more! Robyna is a Brisbane local working now as the Practice Manager of Estate First Lawyers. She has spent almost 20 years working in law firms primarily in IT and I have to say, prior to meeting Robyna I had no idea just how involved (and big) the IT departments of large law firms really are! Robyna shares my passion for fashion, family and technology! Like all of us parents she has had to manage the ‘juggle’ that is family and career and has many great insights on how she has worked her way through. Robyna also spoke very openly about a deep tragedy she experienced some years ago, losing her second child when he was only two weeks of age. We spoke a lot about how such significant tragedies often force changes in our lives sometimes for the best. Robyna has written about her experiences on the blog “The Mummy and Minx” which I really encourage you to have a look at. Like all of my interviews, Robyna was a pleasure to chat to. She has so much great knowledge on IT I didn’t know where to start, so just asked for her ‘top free or almost free programs or products’ that help her get through her day as I decided that would be most helpful to all of us non-IT experts!! Growing up in Brisbane, attending QUT and her double degree in Law and IT. Why Robyna chose to stay within IT in law rather than proceeding with a graduate lawyer role. How life as a mum forced changes in Robyna’s work and importantly how that was supported by her employer at the time, Cooper Grace Ward Solicitors. The difficulty of loosing a child at very a young age and the way it has reshaped Robyna’s life. Moving from a large firm, to working for herself and then to a boutique firm and the pros and cons of both. The beauty of disconnecting from technology as well as the wonderful relationships that come from online connections. The balance that needs to come from this. 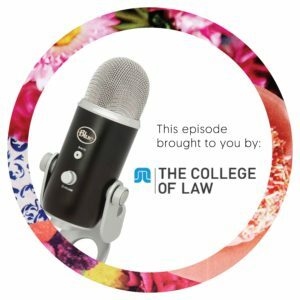 Robyna’s predictions for the future of law including technology, Artificial Intelligence (AI) and why we need to embrace these changes rather than fear them. Why we need to find the thing that you love, it does not need to be your career but something you enjoy and do regularly! Blogging! Robyna’s blog “The Mummy and the Minx” and how much joy can come from blogging. And of course, Robyna’s Happiness Tip for the week. Sit back and enjoy Robyna’s many insights into the world of law, technology and family.